Skunks are house cat-sized mammals native to North America. There are several types of skunks. The striped skunk is the most common, found in nearly all of the continental United States and the southern half of Canada. It is mostly black with white on top of the head and neck and extending down the back, usually separating into two white stripes. Spotted skunks are the second most common, ranging from the southeastern U.S. to the northwestern Midwest and slightly west of the Mississippi River. Spotted skunks are smaller and black with white spots or short white streaks. 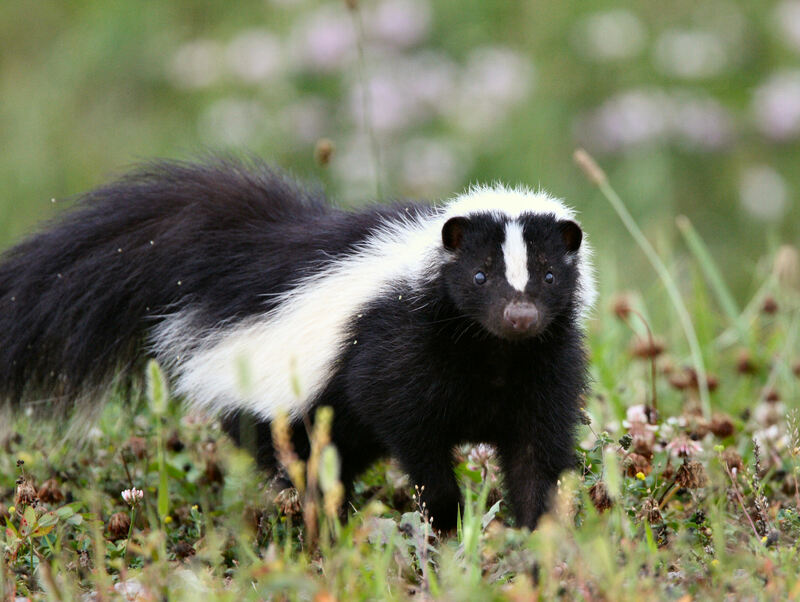 Skunks inhabit old fields, pastures, and woodland edges in rural and urban areas. They are nocturnal and become seasonally dormant in winter. They den in thick brush piles or woodchuck holes, and under decks and porches. Mating takes place during late February and early March, and an average of six blind and helpless young are born between late April and early June. About seven weeks later, the young begin to venture out with the female and are able to spray musk. Young skunks usually disperse during the fall of their first year. Skunks are omnivorous but especially fond of insects, earthworms, small amphibians, mushrooms, small mammals, as well as fruits and nuts when seasonally available. They also will eat pet food and garbage if readily available. Skunks often damage lawns when they dig for grubs and insect larvae. 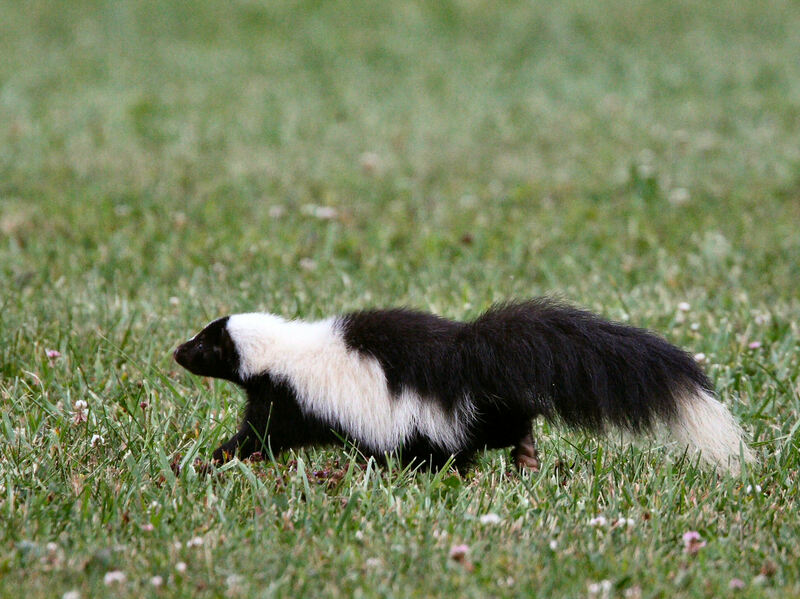 Skunks discharge their spray when frightened or attacked by pets and predators, interacting with other skunks, or when dying. The pungent odor is nauseating to many. Skunks are known carriers of rabies; therefore any skunks observed behaving abnormally or sickly should be avoided. The following symptoms may indicate the presence of rabies or other neurological diseases in mammals: disorientation, impaired movement, paralysis or lack of coordination, unprovoked aggression, strange vocalizations, excess salivation, and unusually friendly behavior. If you see this behavior, avoid the animal and notify your local police or animal control officer.